Weighty Matters: So What Happens to Employee Health After a Year of Treadmill Desk Walking? So What Happens to Employee Health After a Year of Treadmill Desk Walking? Not as much as one might hope or guess. This month's Obesity journal details a year long study conducted at a financial services corporation in Minneapolis where 36 sedentary office workers had their desks swapped with treadmill desks. 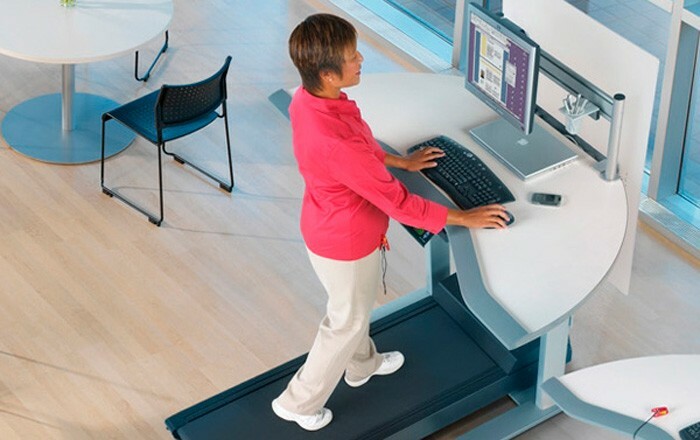 The treadmill desks cost roughly $126,000 ($3,500 or so a piece - that's a photo of one up above from Steelcase) so no doubt any company considering making this switch will want to evaluate the outcomes. Well it isn't about to help folks lose piles of weight, but maybe a teeny tiny bit. As far as statistically significant differences go there were four. A 3lb weight loss, a 7% rise in HDL, a 1.6 inch decrease in waist circumference and a 3 point drop in systolic blood pressure. As far as impact on activity and sedentary time goes - a $3,500 treadmill desk led workers to take on average 852 more steps a day and decrease their sedentary time by 43 minutes a day. The desks weren't found to lead to any changes in workplace performance (for the better or for the worse). 1. Would these extremely modest improvements lead to sufficient health care savings so as to be cost effective enough for a corporation to consider the desks' capital cost outlay? 2. How/why did having a treadmill desk in place of a sitting one only lead participants to be 43 minutes less sedentary and increase their daily steps by just 852? Is the Secret to Happiness Being More Dog?